Thanks to my constant watch on E-Bay of anything pertaining to Gerald, the above photos came on sale recently. Gerald was a panelist on a show called “Bachelor’s Heaven”. The man he is sitting beside is Paul Coates who, according to IMDb, was a press agent, drama critic and crime reporter in New York before he worked in Hollywood. 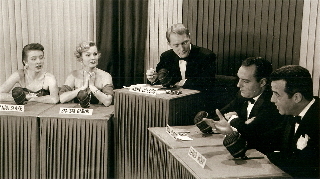 The lady panelists are Amanda Blake (Miss Kitty in “Gunsmoke”) and Zsa Zsa Gabor, who needs no introduction. The host is John Jacobs. I could find nothing on IMDb about the show or its screen dates but, judging for Gerald’s appearance, I would place it during 1951 or 1952. 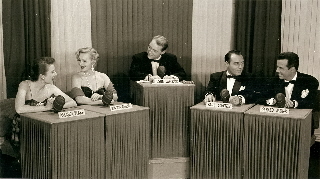 The import of the show was that the panelists caustically tangled horns with one another on men versus woman subjects of the day. If any gentle reader can supply me with further information about this show, please contact me at lindacwood@geraldmohr.biz.